If you don't see the update, and you couldn't or didn't manually download it from one of the links at OnePlus' forums, official images were posted by OnePlus just yesterday. Merry (early) Christmas, OnePlus 5 owners. Oxygen OS 5.0 is now out of beta for the OnePlus 5. Not only do you get to enjoy a holiday taste of Android 8.0 Oreo, but this update also includes the latest security patches for December. The OTA is incrementally rolling out now so it could be a while before you see it, though. Outside the update to Android 8.0 Oreo, the other changes included in the OTA are smaller, and we've covered most of the features individually in previous updates. You can check out our coverage for the Gallery update, recent camera tweaks, and Parallel Apps if you'd like to see more. Historically, you can trigger OnePlus updates early by VPNing to specific markets the company uses for testing. Usually Germany works [Update: German builds may currently be broken, use Canada]. If you are already on the Open Beta, unfortunately you can't OTA to this latest release. 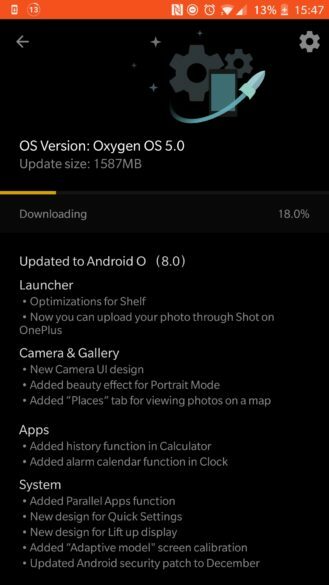 Based on some reports posted to reddit, this OnePlus 5 update may be the same sort of Nougat-Oreo mishmash that the OnePlus 3/3T was updated to. If that's true, it means some things like the settings app, some hardware binaries, and the version of Play Services installed are older Nougat versions for some unknown reason. On the OnePlus 3 and 3T, this faux-Oreo software has resulted in battery, performance, and stability problems for some, including me. That could explain why the update was later pulled. 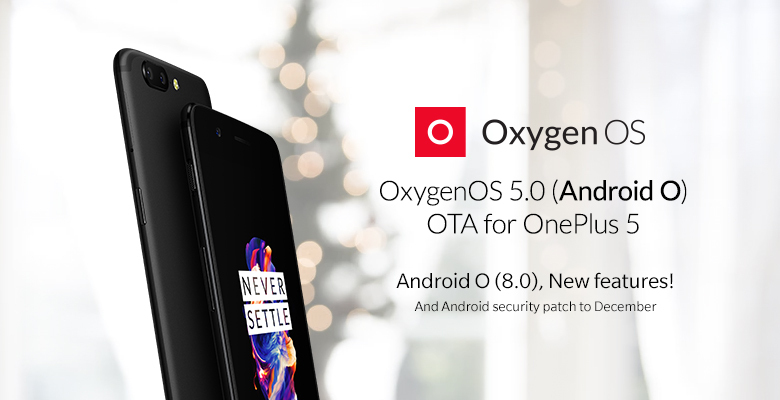 If Oxygen OS for the OnePlus 5 has the same strange mixture of Oreo and Nougat on it, we hope it doesn't result in the same sort of problems. In either event, if you were waiting for Oreo to land on your OnePlus 5, here it is. Edit: Because of a bug on Oxygen 5.0, we have cancelled its global release. And we're preparing for Oxygen 5.0.1, the partial release will go alive soon. Apparently, the update is also failing if you have an unlocked bootloader, so you'll either need to re-lock, or find a way to flash it manually. Based on reports in the original thread, some 3rd party builds of TWRP (such as that by XDA Developer codeworks) are able to play nice with this update so you can bump up to 5.0.1 without having to wipe. If you don't see the update, and you couldn't or didn't manually download it from one of the links at OnePlus' forums, official images were posted by OnePlus just yesterday. Head on over to downloads.oneplus.net and you can pull down the latest full factory image for 5.0.1.